John J Heartfield is Director of eCurtain Media LLC, Creations and Commerce. Many artists and small business owners have something in common. They struggle to create something great. Then they often discover it’s a much more challenging struggle to promote and market their creation. John J Heartfield has been on both sides of the equation. He created eCurtain Media to help. John is an author of fiction and nonfiction. He made certain his book regarding how to correctly build a small business website, Make Your Small Business Website Work, didn’t focus on constantly changing technology. Instead, he provides easy answers to questions about how to build content, navigation, and design that works on the Internet. John has always been an avid reader of detective and adventure novels. Click here to sample the first three chapters of John’s action-adventure novel Controlling Time. John has been writing songs since he first picked up an instrument at age eleven. He’s performed in bands and theater productions in New York and California. He’s currently working on bringing together graphic novelists, musicians, and artists to present The International Multimedia Event One Hand! The event has a groundbreaking digital format. It will oppose fascist propaganda in the spirit of John’s famous grandfather. Japan’s Ministry of Trade and Industry (MITI), The Tokyo Metropolitan Government, and The Multimedia Association of Japan honored John by inviting him to Tokyo to inaugurate the Time 24 multimedia facility. 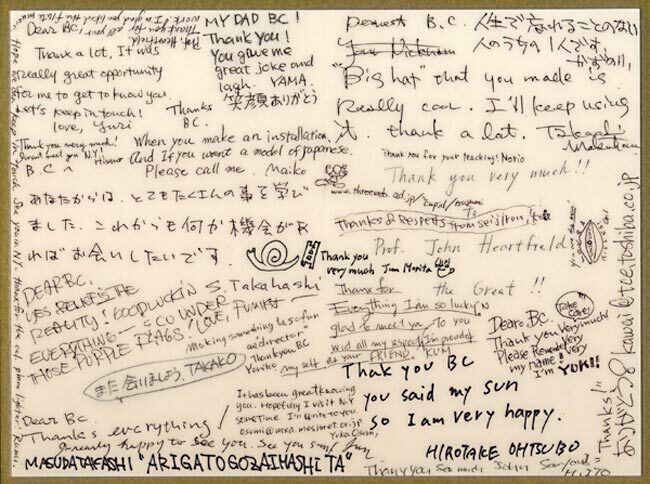 While in Japan, he gave presentations to large audiences of government officials, corporate leaders, and multimedia professionals. He led a two-week seminar for young brilliant aspiring multimedia artists. He’s spoken to enthusiastic audiences about politics and art at venues as diverse as New York University, corporate conference rooms, and outdoor events such as Mahnmal Friedenskreuz St. Lorenz in Austria. In November 2016, John was invited to give a presentation in the San Francisco Collage Museum for the DADA WORLD FAIR, sponsored by The City Lights Bookstore and Swissex. He was a featured speaker at the The Time Tunnel Festival in Liverpool’s Walker Art Gallery. Check this website for John’s appearances on panels and at exhibition in 2019. 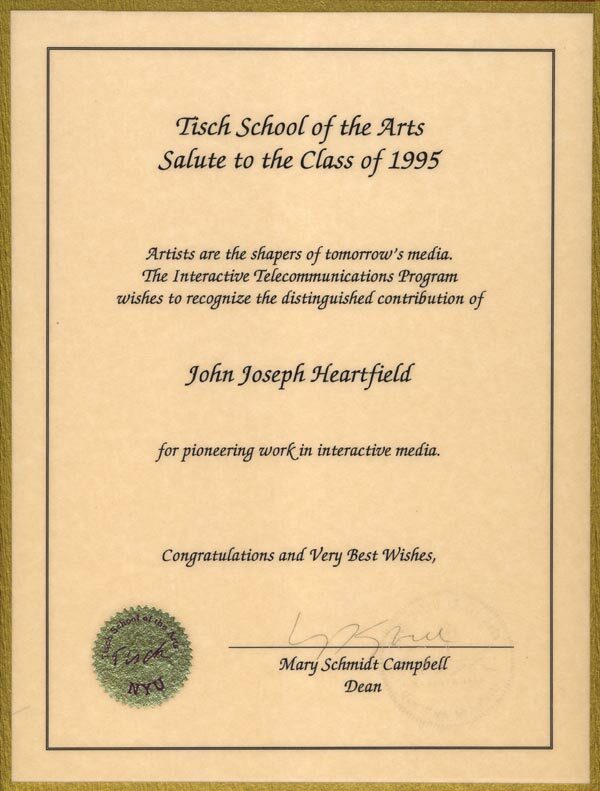 Professor Heartfield has designed and taught more than twenty-five university courses in digital media design and programming in schools such as the Tisch School of the Arts (New York University), The College Of New Jersey, and Queens College, City University of New York. His professional roles have included Creative Director, Senior User Interface Designer, and Media Programmer. He was a sought-after multimedia consultant for several of America’s largest corporations. He continues to help a select number of artists and small businesses to succeed on the web. • Increasing the recognition and renown of his courageous grandfather. • Expanding this exhibition into a place to display the art of artists with courage and integrity. Many artists suffer for their art. All artists suffer promoting their art. Please join our social media sites for important updates.